Apple on Monday posted a trio of short tutorial videos to its YouTube channel explaining how to take perfect Portrait selfies with iPhone X and bouncing Live Photos with all current iPhone models. A continuation of its iPhone tutorial series, the latest 35-second spots run through brief, easy-to-follow instructions covering selfies taken by iPhone and the latest version of iOS. The first video explains how to use a new built-in Live Photos feature called "Bounce," which cycles a captured video clip forwards and backwards. Released as part of iOS 11, the effect uses artificial intelligence to detect a start and stop point to a particular action, in this case performing a somersault from the roof of a car. Once the action finishes, Bounce rebounds to the start point and resumes playback. Alongside the Live Photo how-to, Apple released two other videos covering Portrait selfies on iPhone X. 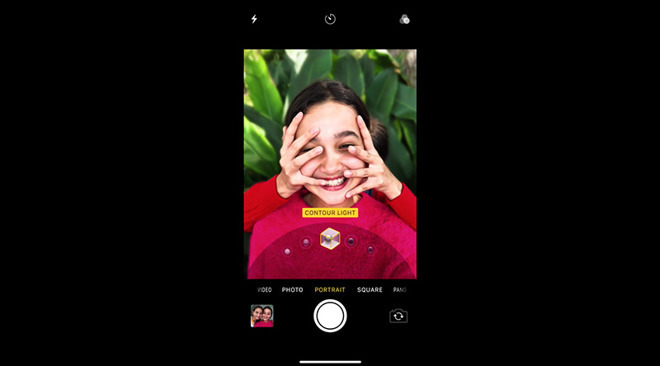 Specifically, the company runs through the process of selecting Portrait mode in the camera app, an option that, thanks to its TrueDepth camera, is also available to iPhone X's front-facing shooter. After selecting "front facing" and "Portrait," users can browse Apple's latest Portrait Lighting effects, which uses depth information and complex algorithms to calculate how a user's facial features interact with light. This data, computed by Apple's A11 Bionic chip and integrated image processor, results in realistic lighting effects without need for external lighting equipment. The second Portrait selfie video describes how to edit shots after they are captured. With iOS 11 and iPhone X, Portrait mode photos are saved with depth data intact, meaning they can later be tweaked from the Photos app. Users can shoot a selfie with Stage Light, for example, and later change the effect to Contour Light or Natural Light if they so choose. After initial analyst worries that Apple chased away potential customers with iPhone X's premium pricing, the company this month revealed its flagship handset outsold all other models on a weekly basis since its debut in November. In addition to packing in specialized camera equipment — TrueDepth is an integral part of Apple's new Face ID biometric security — iPhone X is the first iPhone in three generations to feature a full redesign complete with edge-to-edge display and "glass sandwich" chassis.